Niall Fotheringham, Energy Performance Manager, is inspired by the changing engineering landscape and draws comparisons how technology has developed to reduce energy consumption. Niall shares his thoughts ahead of our "Saving Energy at Northumbria University" event on Tuesday 20th February, in partnership with BIFM. Guests can learn how our improvements reduced energy consumption and carbon footprint on campus. It is free to attend, register on Eventbrite. Since the new Queensferry Crossing opened in August I have regularly commuted across the River Forth. It is the tallest bridge in the UK, and is the longest three-tower cable-stayed bridge in the world. 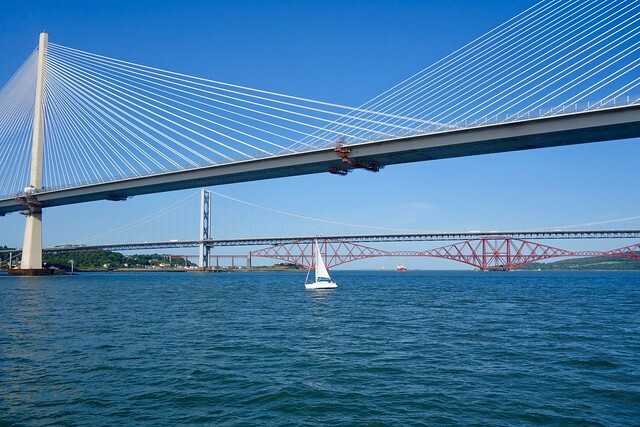 The adjacent Forth Road Bridge was the longest two-tower construction when it was built and alongside these two road bridges stands the iconic Forth Bridge. Together, these three bridges show how engineering has developed over hundreds of years to aid mass transit between Fife and Edinburgh. There’s no difference with buildings – how we build has changed, how buildings use energy has changed. Technology improves, regulations move on, insulation, lighting, controls, HVAC and all the other fabric and internal services that make our buildings comfortable develop, just like the engineering and our bridges. As an Energy Manager I am programmed to notice these things, but, every time I pass through the station the lights are on, no matter what time of the day! To make matters worse, the majority don’t appear to be LED, a technology that was well developed at the time of refurbishment. These simple things would save thousands in energy and maintenance costs. The development won a Saltire Award for Engineering Excellence, a fantastic achievement, but what about the lighting controls? This is where we, the Robertson Energy Services team, come in. In fact, it is our bread and butter. We remove the old lighting and plant before replacing it with new more efficient options. We listen to our clients so that we can achieve this work with minimal disruption to a building and its occupants. Don’t just take my word for it – you can come and see for yourself how we reduced energy consumption and improved the student experience at Northumbria University. This building includes light switches and another lighting controls, so you’ll never see lighting on where it shouldn’t be! We are holding an event on Tuesday 20th February 2018 to showcase the work we did to save energy on campus. You can meet the team, see how it was done and even talk to the client. This event is free to attend - please register on Eventbrite.